In The Spotlight, Inc.: REVIEW: Goodspeed Opera House, Oliver! Goodspeed’s production of “Oliver” is among its finest. 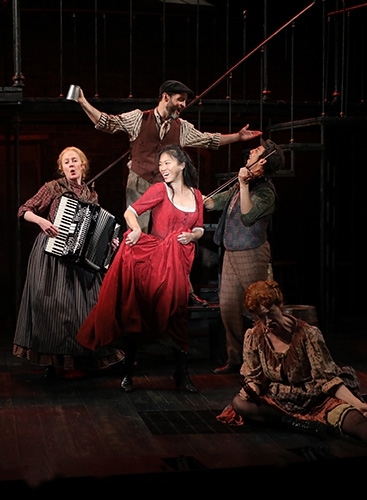 There are numerous reasons why this musical deserves five stars; two of which are “Oliver” is rarely performed (perhaps because casting calls for a significant amount of boy actors), and Goodspeed is given the challenge of mounting a substantial piece on its small stage. Charles Dickens’ classic, set to music and lyrics by Lionel Bart, is the saga of poor orphan Oliver Twist on the streets of London in the mid 1800’s. Most are familiar with the story of loneliness, innocence, courage, kindness, and family, all wrapped up in this one little boy and the lives of those he touches. “Oliver’s” plot is dark, yet with humor; its characters mundane, yet with individuality. The musical is packed with lots of songs; more than usual in this genre. Goodspeed’s director Rob Ruggiero (also of TheatreWorks in Hartford) has the difficulty and/or joy of balancing big ensemble numbers between solos and duets. Oftentimes, musical production staff prides themselves on one winning showstopper. Ruggiero, et al, have five, all extremely executed full-cast productions; i.e. “Consider Yourself” and “Oom-Pah-Pah.” James Gray’s choreography is purposely not state-of-the-art precision of today’s musicals, but a bit disjointed and seemingly scrappy, which adds authenticity to the era in which the story is set. Offset between the ensemble song and dance pieces are many memorable solos; i.e. Oliver’s emotionally sweet “Where Is Love,” Fagin’s humorously agonizing “Reviewing the Situation,” and Nancy’s wrenchingly powerful “As Long as He Needs Me.” Indeed, the actors portraying these characters are the standouts. Elijah Rayman dons his Oliver with freshness that is not overly sweet. Donald Corren gives a naivety to Fagin that is unexpected and sincere. EJ Zimmerman expresses emotions of joy and love in Nancy that are undeniably sensitive. In “reviewing the situation” there are other factors to applaud, especially: Michael Schweikardt’s 15 or so sets all formed from metal steps and bars; John Lasiter’s lighting that evokes the Bill Sykes character as the devil personified; conductor Michael O’Flaherty’s impressive orchestra; and The Kids – an ever-present 12 talented boys and girls. Yet, speaking of kids, advice is to consider leaving younger children at home. Yes, “Oliver” is a musical about kids (and far more, including physical abuse and murder), but not necessarily for your children.